We are always looking for ways to help you grow your business. This quarter, we have some exciting updates and opportunities that can help grow revenue on your existing implementations. At the same time, we also want to encourage you to explore additional opportunities and lines of revenue that can help you diversify and grow even further. As always, if you have any questions or would like to learn more about the below updates, please contact your Partner Manager. We have six new sponsored search features available for Partners! These features are being tested now and will be available for worldwide syndication (with the exception of Hong Kong and Taiwan) this summer. Callout Extension - Callout Extensions are 2-4 "callouts" or extra snippets of text that highlight the website's products or deals. Review Extension - Review Extensions highlight a phrase from a flattering review, along with a link to the source of the quote. 4th Line Annotation - 4th Line Annotations are a second line of description text that contains the best information from Dynamic Description and Related Info. Top Ad Annotation - Top Ad Annotations display text regarding the number of user visits to the website over time. Security Badge Annotation - Security Badge Annotations add a "badge" to the ad to indicate the advertiser's website is secured by a third-party antivirus provider. Brand Annotation - Brand Annotations add a brand label to ads when eligible. We launched the first three sponsored search features together (Callout Extension, Review Extension and 4th Line Annotation) on YHS desktop and saw a lift of +1.7% CTR and +2.1% RPM. We estimate that Partners will experience similar lifts, especially when launching all six features at once. If you are interested in expanding further into the Mobile space, please contact your Partner Manager to learn more. We are launching a new New Tab! 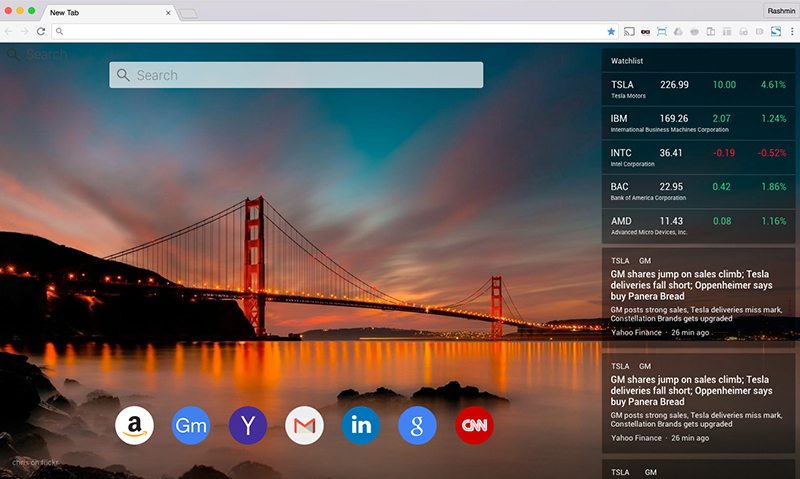 The Yahoo New Tab has been performing well for Partners and Yahoo. Users have responded positively to the visual integration of beautiful background Flickr photos from around the Web and most recently visited websites. We are tapping another Yahoo resource, Yahoo Finance, to enhance another custom new tab experience. Yahoo Finance is the category leader and #1 finance website. The Finance New Tab will display current stock prices based on a saved watchlist. Users will also get regularly updated news related to those stocks for a quick snapshot of investments every time a new tab is opened. This browser extension will be available for Partner distribution in Q3 2017. We will also have an installer solution that can distribute the new tab extension from Chrome and Firefox, as well as through HP sets from Internet Explorer. We held a webinar with the Marketplace Integrity Team (MIT) on March 30. Guillaume Courcoux presented an overview of MIT's role and evolving relationship with Partners and Microsoft. We had over 20 Partners participate in the webinar. If you were unable to join or would like to view it again, you can download the presentation and view a recording of the webinar on our Partner website here. MIT maintains the balance between Partners, advertisers and users to ensure a healthy marketplace. The MIT team also works closely with their counterparts at Microsoft to ensure and grow the quality of Yahoo's Partner business. We will be holding another webinar in late June 2016. You will receive an email invitation soon with more details.